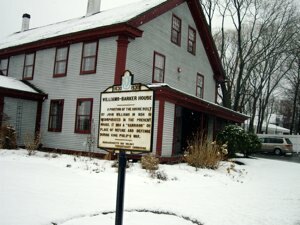 Barker Tavern is located in a historic building in Scituate MA. Heavy beams and wooden walls, once pierced for portholes, bear witness to its use as a garrison house in 1676. Part of the original building is said to be the second oldest standing house in the United States. 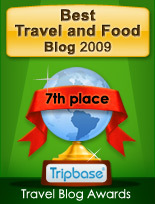 We went there to dine, and had a great culinary experience. Barker Tavern is located in the outskirts of Scituate in the Commonwealth of Massachusetts. The low score on location is due to the fact that Scituate is hard to get to, as long as you do not have a car available. Scituate is located 30-40 minutes by car south of Boston. Until recently the only public transportation available were buses driving to and from Boston during peak hours. Now you may take the new suburban rail line to Greenbush, but you are still a 3o minute walk to the scenic Scituate habour. Williams-Barker House - anno 1634? 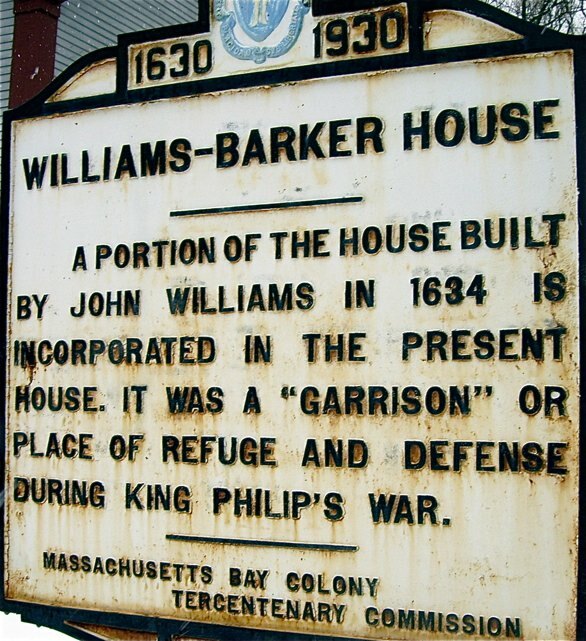 The Williams-Barker House claim, according to old records to date back to 1634. If this is right, it would be one of the oldest houses still standing in North America. It is, however, not mentioned among the historic houses of Massachusetts. Its interior is however marked by old age. I recognize the same architectural features as I find in our own summer home that dates back before 1600, much earlier than Barker Tavern is supposed to date back to. Dark, rough wooden beams, white walls enhanced by classic style furniture. Barker Tavern offers excellent service from a professional staff, good information on the general menu and today's specials. Smooth ordering and food and wine was served with skill and style. I always find ordering a three-course dinner in the US a gamble. 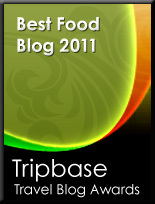 This as you always risk being served huge portions leaving you completely stuffed in the middle of the main course. Being in a posh place, we decided to split the first course and indulge in a main course. Barker Tavern had certainly an extensive menu to choose from at, for me, quite reasonable prices. I love finger food, so I ordered Seafood Platter as a starter to share (a great idea if you are two or three). 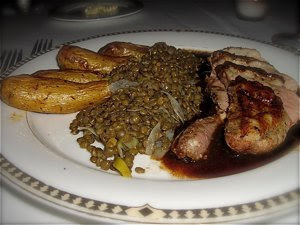 Then I ordered fried duck breast with red wine sauce, oven baked potatoes and Puy lentils as main course. 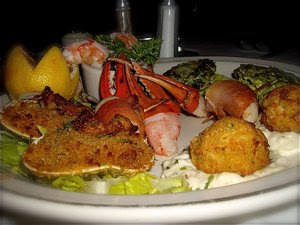 The delicately presented seafood platter contained cocktail shrimps, crab claws, clams casino, oysters rockefeller, crabcakes and scallops wrapped in prosciutto. There were two of each 6 items, and we ended up choosing 4 out of 6 appetizers. Steamed, brightly red crab claws, pink shrimp tails, mild in taste and lean. I simply loved the fried clams and oysters, coated with crisp breadcrumbs with moist molluscs mixed with tasty bacon. Scallops with prosciutto or bacon is a great idea, for a snack served at a drink's party. It combining saltiness with the gentle sweetness found in the scallops. The seafood platter at Barker Tavern provided a great teaser for what was to come, a great main course. Duck breast is one of my favourite dishes, and the staff at Barker Tavern certainly knew how to prepare it. It was served with baked amandine potatoes and Puy lentils, a strange combination, as lentils often substitute potatoes and are not often used as main greens. I personally would have prepared either or, and had another main vegetable on the dish, but the combination worked. Nothing wrong with the duck breast and veggies, though, as all was prepared to perfection, meat very moist and still delicately pink in the middle, and both lentils and potatoes were firm and not over cooked. Barker Tavern is certainly in the upper crust of restaurants I've visited during my years in New England. 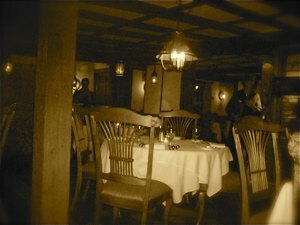 With most main courses priced under $30, good service and great historic atmosphere it is most certainly a place to consider for a good meal. If you have a car, that is, as it is located off the beaten tracks if you relying on public transportation to get around.